Route 56, when recently opened, brought traffic relief to the North Inland Corridor by providing a much needed connection between I-15 and I-5. But, there are some other important new road connections that have also opened between Rancho Bernardo and Carmel Valley. As of June, 2007, you can now drive from Rancho Bernardo to the coast, via Ted Williams Parkway / Route 56, without first having to go on I-15. The western edge of Bernardo Center Drive, where it crosses Dove Canyon Road at 4S Ranch, now extends around Black Mountain to connect with Carmel Valley Road in Rancho Penasquitos. This offers a new direct way to drive between Rancho Bernardo and the Coastal areas, without having to first go on I-15. The last construction project is a bridge that crosses the wildlife corridor near Black Mountain. Newland Communities, the master developer of 4S Ranch has built the first two lanes of the bridge. In next few years, the Black Mountain Ranch developers will build the other two lanes of the bridge. Right now, the first two lanes are open, and at a later time it will expand to four lanes. The opening of this important road connection had been delayed several times, but finally opened in June, 2007. It was reported on March 7, 2007 that the barricade had been taken down, and that this new road connection was now open. The official opening was to come a few weeks later, but to the relief of local motorists, these roads were finally connected. 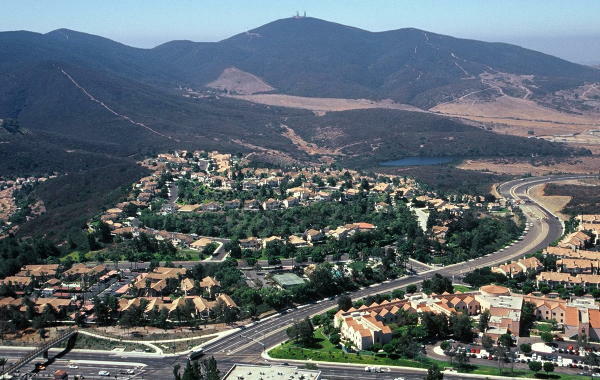 Camino Del Norte passes from I-15 in Rancho Bernardo through 4S Ranch and Santa Fe Valley to the new Del Sur area. At that point it now turns into Camino Del Sur which runs south to Route 56. This important road connection was constructed by Black Mountain Ranch (the developers of Santaluz and Del Sur). After several delays, both road connections are now open. Camino Del Norte to Camino Del Sur opened in March, 2007 and Bernardo Center Drive to Carmel Valley Road at Black Mountain opened in June, 2007.